If you grew up in the 1940’s you’ll have fond memories of Saturday afternoons well spent at the movie theatre. Sitting anxiously, with bated breath we waited through the coming attractions, newsreels and cartoons, looking forward to the next chapter of our favorite serial. 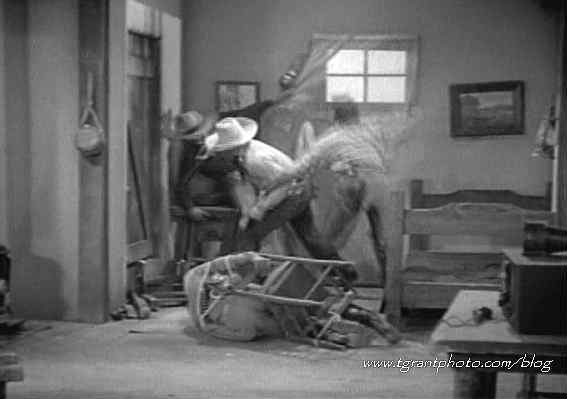 KING OF THE TEXAS RANGERS (1941) is one of those wonderful serials! 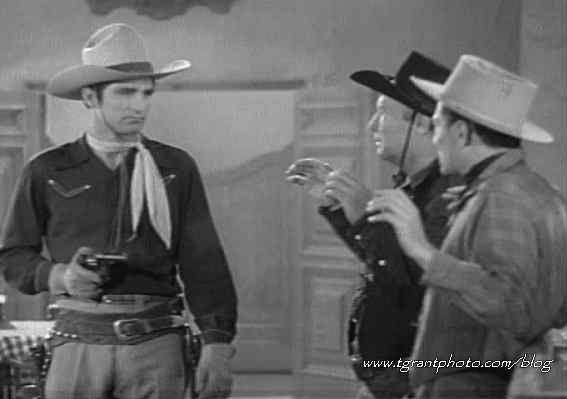 Football-player-turned-actor, “Slingin’ Sammy” Baugh, stars as Texas Ranger Tom King, who must avenge the death of his father. 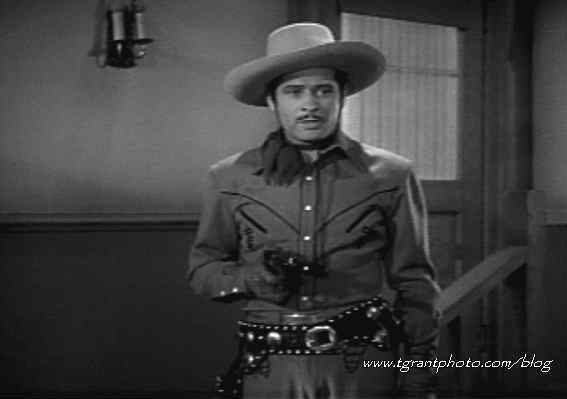 Duncan Renaldo, of TV’s Cisco Kid fame, co-stars as Lt. Pedro Garcia who becomes King’s sidekick and friend. 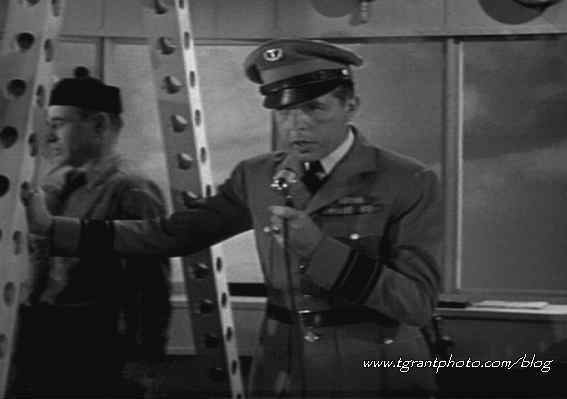 Neil Hamilton, light years before his role as TV’s Commissioner Gordon on BATMAN, plays a duplicitous fifth columnist who’s helping the Nazis (although they’re never mentioned as such in the serial). The plot’s quite standard for a serial, but the real delight comes from watching the frenetically paced action sequences. 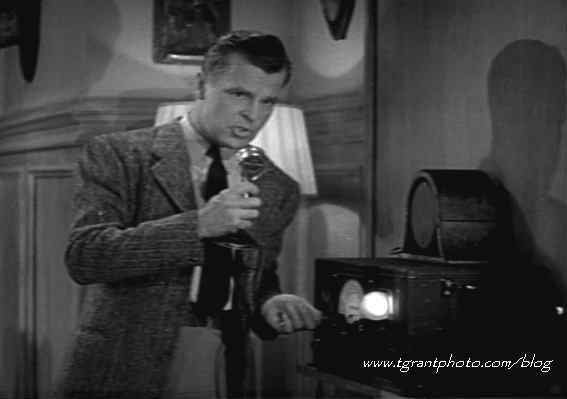 Republic writers were often told to keep the dialogue in serials to under 700 words per episode, and as you can imagine this leaves lots of room for the action parts! 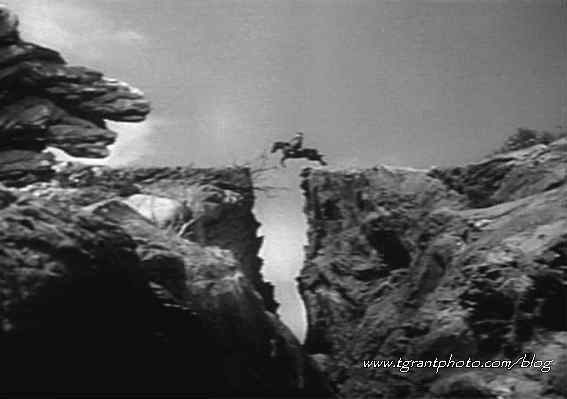 There’s shoot-outs, crashes, explosions, exciting chases on horseback and best of all, the amazing stunt work. It’s all carefully choreographed by a skilled team of stunt professionals who put their lives (and limbs) on the line for the sake of the serial. You’ll find yourself reaching for the “pause” button to see just how the stunts were done. 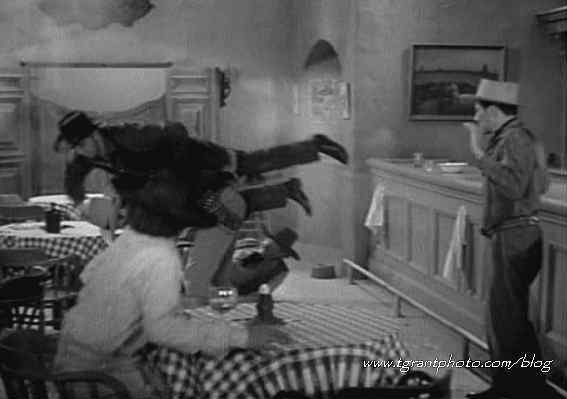 There’s amazing back flips, jumps and falls, all done without CGI ! The images shown below don’t do the stunts justice, you really need to see them in action! KING OF THE TEXAS RANGERS also features wonderful miniature work from the extremely talented team of Howard and Theodore Lydecker. 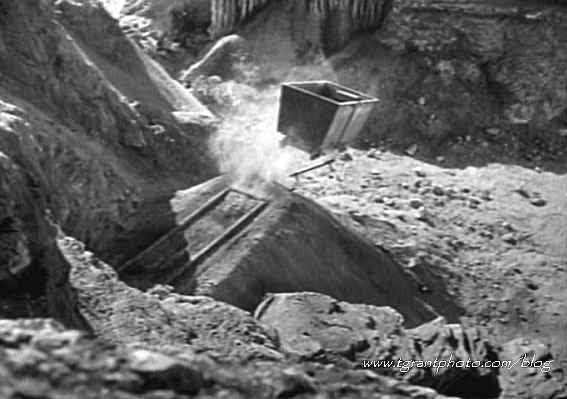 Miniature sets were carefully crafted to duplicate real locations….then they were blown up! The Lydeckers often filmed these miniatures outdoors, utilizing natural light, which adds greatly to their realism. 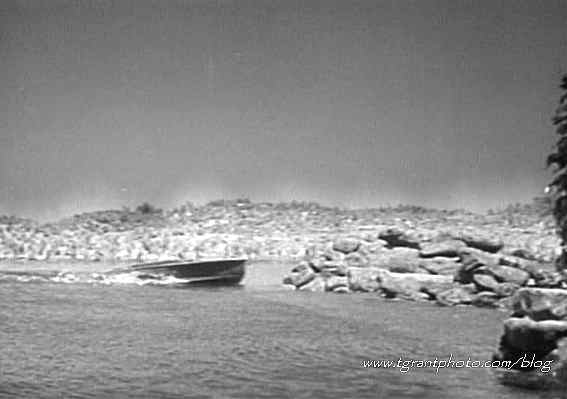 Throughout the serial you’ll see amazing explosions, car crashes and other realistic-looking “disasters”. 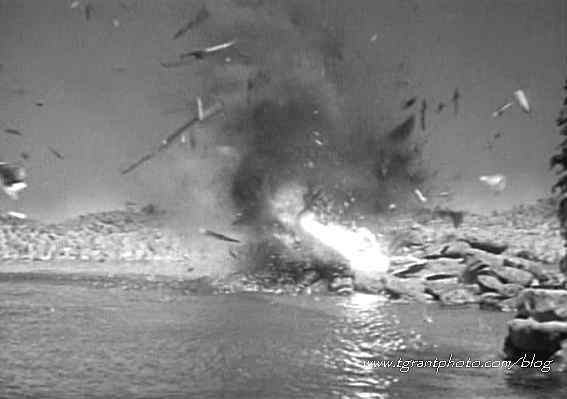 They’re all quite detailed, even to the point of wood scraps flying everywhere during an explosion! 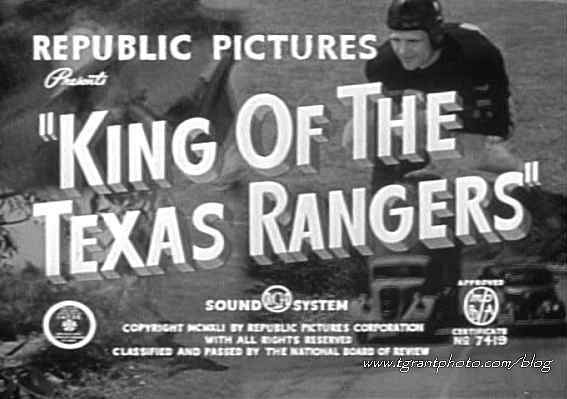 On KING OF THE TEXAS RANGERS, as with most Republic serials, directors worked in pairs, William Witney handling the action sequences while John English took charge of the dramatic exposition. Their teamwork is rewarded with a tight combination of action and dialogue. If you watch any of the Witney-English co-directed serials you won’t be disappointed! It’s all high-spirited fun and action — guaranteed to please the 12 year old kid in you! 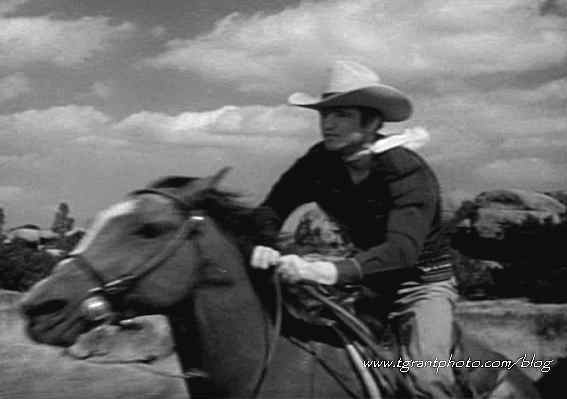 Note: — The best quality prints of KING OF THE TEXAS RANGERS can be seen on Republic Pictures’ VHS or Laserdisc releases, which are purportedly made from Republic’s own 35mm negatives. There is no commercially released DVD, so the quality of no-name DVD’s may be poor. 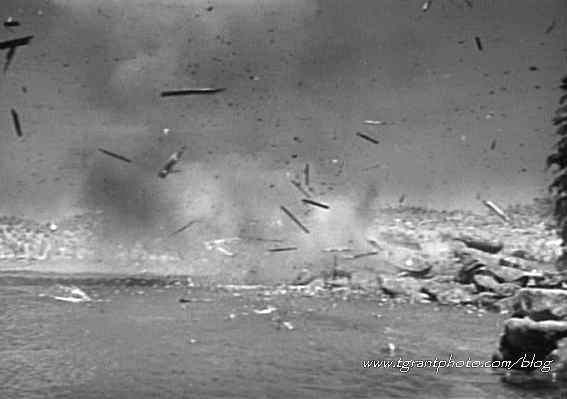 Lots of good explosions, courtesy of the Lydecker brothers! The Good Guys always win in the end!